PowderAlert #21: where to go? PowderAlert # 21 is coming! We may have switched to daylight saving time and have ended up in the meteorological spring for a few weeks, but do not forget that the R is still in the month. Winter tires still under your car? Still have some free days to spend? Fancy the ultimate April dump? Here he comes ... the ultimate 'f^#k the summer I still want snow dump'. If most of the cold air comes through the north of France to the Alps, then the Gotthard region and later larger parts of Switzerland could become the big winner because the snow then first flows in from the southwest and then in the form of a sandwich the Alps. But before it's time, it is still mild and sunny in the Alps. Monday is clearly sunny and it is not until Tuesday that you notice the change in the higher clouds. 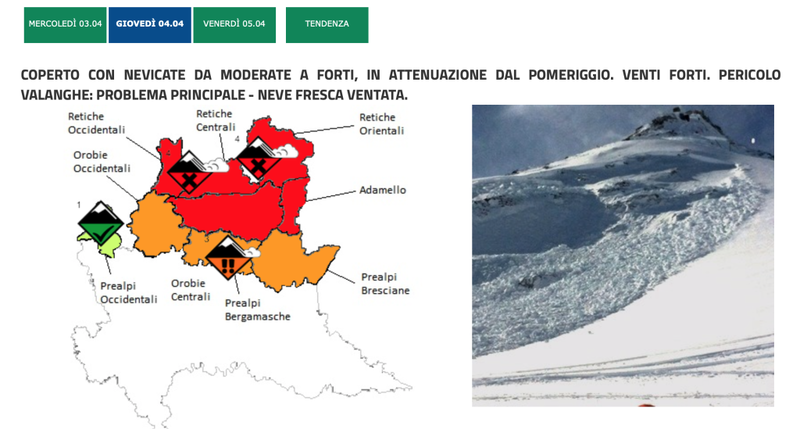 A southern Föhn starts in the course of the afternoon and the clouds rise between the Monte Rosa-Gotthard-Piz Bernina it starts snowing with a southwestern current in the night from Tuesday to Wednesday. With a snow line around 1600 meters on Wednesday morning, this already produces the first snow around the Monte Rosa, the Gotthard region and around the Susten Pass. Although there is already the first fresh snow on Wednesday morning, Wednesday is certainly not a powder day. It is then still waiting for the cold front (the blue line on the map above). It is expected to travel into the Alps from the west in the course of the morning. In the run-up to that, the clouds push back on the south side of the Alps with heavy snowfall south of the French Ecrins, the western and northern Piedmont, the area from Monte Rosa via the Gotthard to the Piz Bernina and later extending to the Ortler region and even to the south of the Austrian Otztal. A typical southwest dump. The snow line then fluctuates between 1500 and 1900 meters with the freezing level around 1700 - 2000 meters. Lots of snow for the high alpine above 2000 meters in the above regions. The cold air from the cold front flows into the western Alps later in the morning. The current becomes west in the French Alps, at the same time it is still southwest in Italy, Switzerland and Austria, with a southern Föhn as a result. The southern Föhn falls away in Switzerland towards the end of the morning, and it snows from the west in the course of Wednesday afternoon. In Austria, the southern Föhn will keep on going until Thursday. With the invasion of the cold front, the current becomes west to northwest in the French Alps and the snow line drops, still southwest on the south side of the Alps with a snow line around 1500 meters and more and more west to north northwest in the Northern Alps with a snow line that drops to 1000 or even 800 meters during the course of Wednesday and Thursday. The following snow quantities are expected until the night to Thursday. The cold air flows further into the Alps on Thursday. In the French Alps, with a north-westerly current, this still means snow for the French northern Alps, while at the same time a cold northern Föhn is created for the French southern Alps. The clouds go away and the sun comes out. Switzerland is still in the line of fire. Cold and warm air come together above Monte Rosa / Haute Valais, the Gotthard / Sustenpass region and the south and center of Graubünden. The snow line is dropping and intense precipitation is coming up. It also starts snowing north of the main alpine ridge, but nothing compared to the regions mentioned above. The snow line drops rapidly towards 1000 meters and the sun comes out from the west in the evening. Italy sees the snow front move very slowly to the east during the day. In the far west it gets better during the morning and in the western and southern Piedmont the sun comes through more and more often. It still snows heavily from the Aosta via the northern Piedmont and Lombardia to beyond the Ortler. The center of gravity shifts from northwestern Italy in the morning to northeastern Italy in the afternoon and evening. 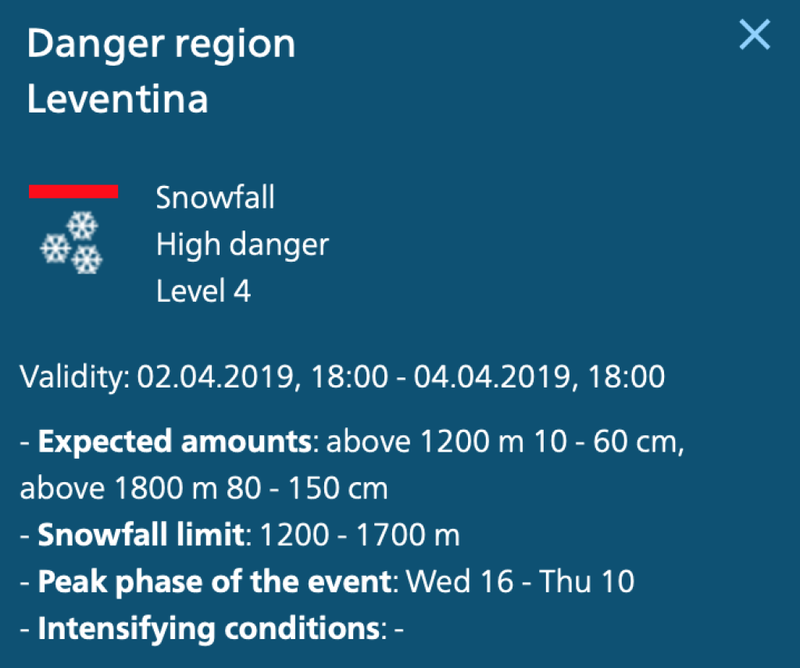 The Dolomites and Alpe di Giulia see most snow only towards the end of Thursday. The snow line is around 1400-1600 meters, but drops from the west to 1000 meters during the day. Up to and including Thursday morning, mainly the southern parts of Austria have seen snow. 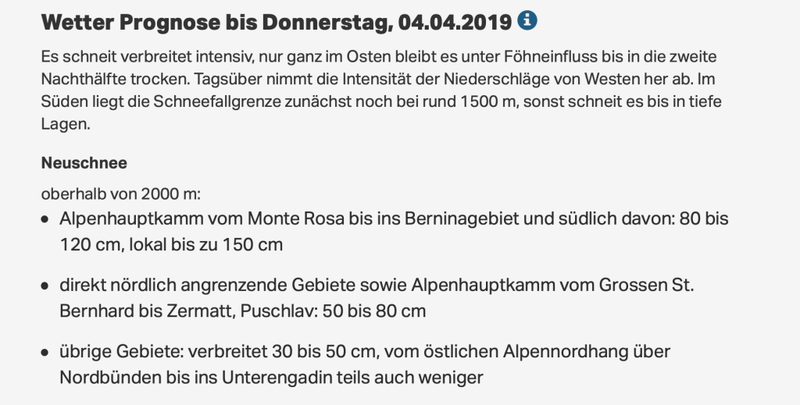 Especially in Ost-Tirol, the southwestern areas of Carinthia and the southernmost areas of Tyrol, the snow cover has grown considerably above 2000 meters. The cold air and snow from the west slowly arrive very early on Thursday morning. In the far west of Vorarlberg it snows in the early morning and only after lunch does the snow fall into Tyrol and then quickly move towards the more eastern areas such as the Salzburgerland and Styria. 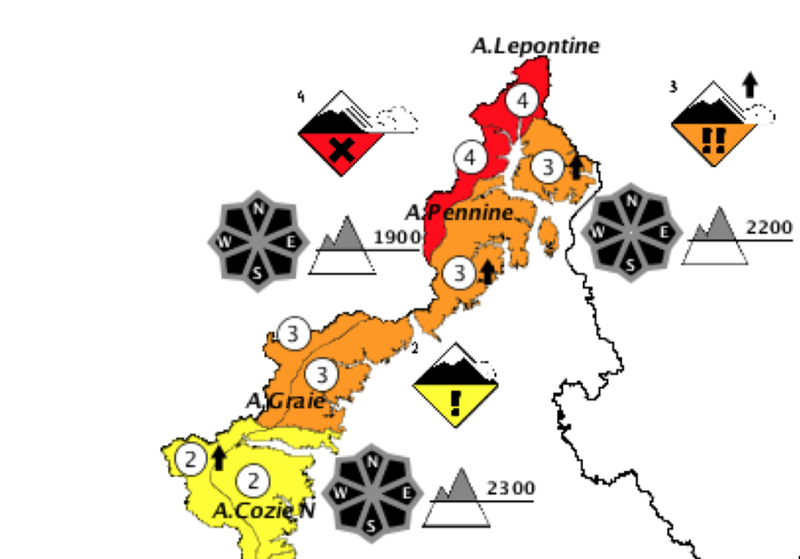 It will snow heavily particularly in the main alpine ridge between Austria and Italy at the end of the day. If most of the cold air comes through the north of France to the Alps, then the Gotthard region and later larger parts of Switzerland could become the big winner because the snow then first flows in from the southwest and after that will form a sandwich around the Alps. Calm weather returns on Friday thanks to (temporary) high pressure. Wednesday: Föhn in the north, incoming snow in the west and heavy snowfall in the south. Not an ideal day, although southwest Engadin can offer something beautiful. But it is possible that I will adjust this list in the coming 48 hours. The adjacent areas will also be good. As long as you take into account the rhythm of the storm and do not arrive early. In Austria, with the exception of the far west of Vorarlberg, you do not have to be earlier than Friday morning. So far my tips. Questions? Drop them below. Sella Nevea ... What u think Morris? Hi Morris, what do you think about skitouring, on saturday, in Bedretto valley or in San Bernardino zone? Birds are singing, it smells flowers, days are longer, brighter and warmer, the only missing piece was fresh snow and god Morris makes our wish come true! Epic spring ski weekend forward! Corvatsh-Diavolezza or Disentis promising, Airolo discounting ski pass to 25 euros with opening extension til 7th of April. @richd Sella Nevea is already in spring mode. Snow pack at the valley bottom is rather poor for the time of the year. At base station of the Prevala lift snowpack is thick but the couloirs have been in better shape than what we've seen this year. I think there are better spots available at the moment. @Trabatea looking good. Be aware that the weekend will be sunny and miild. So the new snowpack might get unstable. @NicZH, airolo will be really good on Thursday and Friday, but saturday and sunday the sun will be strong. Stay on the North Faces. @Peterbilling snowfall will taper off on Thursday and sun is expected at least from Friday till Sunday, maybe even already on Thursday afternoon. Best resort to go to from Venice on Friday-Sunday? Thinking Malga Ciapela/Marmolada due to elevation. Anything else decent in that area or further afield? Should I avoid the lower elevation (up to 2500m) resorts or will the temps stay low enough. Thanks!! Do you think Gemsstock will be accessible on Thursday? Or buttoned up until Friday due to snow/wind/poor visibility ? Hi, it will be deep Engelberg on Friday? Thanks Morris for the great post and for answering questions! What's your advice for the best place to go on Sunday within a 2-hour drive from Geneva? 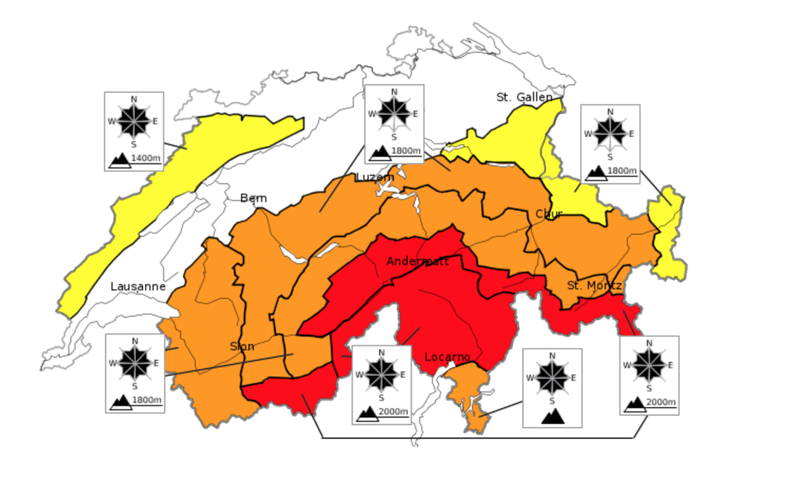 @Peterbilling the western valleys will get definitely more than the eastern valleys (Nendaz, Veysonnaz). Probably 15-35 lower down and up to 50-75 cm at the upper parts. @Scanlory hard to predict at the moment. Normally they will keep it closed with such a storm moving in. @Peterbilling that's a reply on Scanlory's question. If the Gemsstock will be closed. 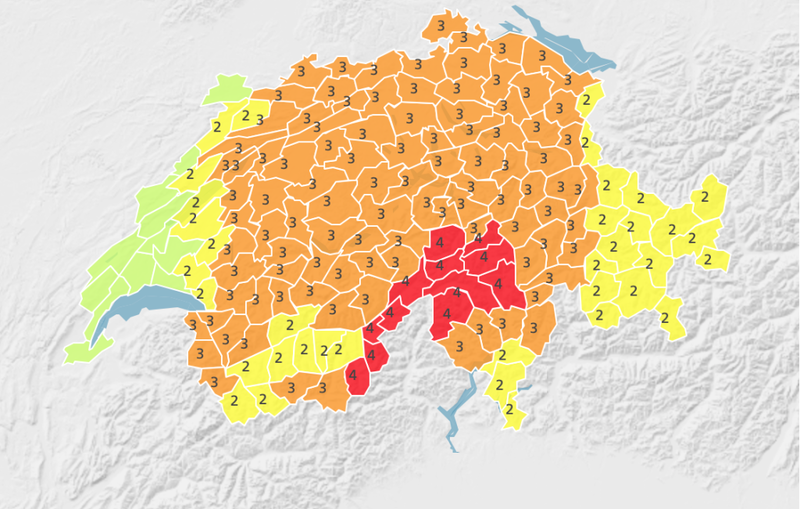 Warning: storm will be intense on Thursday morning in Switzerland with huge accumulations of fresh snow (70 to 150 cm). Please care, share and make aware! Forecast is that the snowpack will settle on Friday and that we may expect more favorable conditions during the weekend. What for expectations do you have Morris about Arlberg, Montafon, Silvretta upcomming days?